In this edition of Real Economy, we take you on a journey to discover how our waste can become sustainable gold – powering the circular economy of tomorrow. When we talk about the circular economy, it is way more than about simply recycling and is very different from the way we produce, consume and live today. In today’s linear economy, we dig, make, use and dispose. We waste 90 percent of raw materials used to make say, a washing machine, before it even leaves the factory. Big companies resell half that waste, but SMEs don’t. The rest ends up in a landfill, along with 80 percent of all the goods we make within the first six months of their life. Moving to a circular economy means changing the way we design, produce and use that washing machine. Imagine products designed to keep remanufacturing, refurbishing and recycling in mind. That means wasting nothing, where every man-made material, metal or biodegradable part is upcycled. By using only renewable energy, we wouldn’t have to hurt the environment for hard to find, finite and expensive resources. A move to a circular economy would save Europe’s businesses €600 billion, reducing our greenhouse gases too. Europe’s Circular Economy package is regarded as packing a punch, money wise. Between Horizon 2020, structural funds, the cohesion fund, they are pumping billions into resource efficiency, research and innovation, low carbon and SMEs. Action wise, they are trying to change waste laws across Europe, set targets for recycling and landfills, and get producers to start reusing their materials. Now companies in the circular economy can save massive amounts in their material budget, cut their energy costs by millions and reduce their carbon emissions by a bucket load. Some companies have already gotten on board with the circular economy principles. The Renault Choisy factory, in France, has been producing car engines and auto parts since 1949 – but with a special touch. “When they get here, auto parts are sorted between the ones that are in too bad a state, which will be re-smelted, and the other ones which will be repaired,” explained euronews’ Guillaume Desjardins. This has allowed the factory to become 100 percent waste free, which has not been easy to achieve. It has been thought of and planned since the early design stages of production and carried on throughout the car’s entire life. “The circular economy starts from conception,” said Philippe Loisel, Director of the Renault Choisy plant. All of this obviously has a cost, but if big groups have entered the battle, it must mean the project is profitable. Indeed, consumers are demanding eco-friendly products- More than 80 percent say it is a criteria when deciding on a purchase. But that is not all. Last year, this saved the car company 80 percent on energy and 88 percent on water – as well as four thousand tons of metal. “When a company gets involved in the circular economy, it will increase its profitability,” explained Matthieu Orphelin, from the Circular Economy and Waste Department, ADEME. “For at least two reasons: first, it will save on raw material costs, as well as waste management costs at the end of the production. Beyond this, in order to be profitable in the long term for companies, an organised market for waste and upcycle material will have to be created. David Palmer-Jones is the President of the European Federation of Waste Management and Environmental Services (FEAD) and CEO of Suez UK. David Palmer-Jones: “There are two types of industry really. There are ones who get it, Already those large industries are making those changes, planning for the future. But there is another group that aren’t doing that, they live in the past. David Palmer-Jones: “Today there’s 800 million tonnes going to landfills which we waste. We bury material and energy in the ground. “What we’ve got to do first is get the facilities, the infrastructure on the ground, locally, serving the populations, serving industry to extract that material. “Eco-design, the way we design things has a massive impact on the sustainability of products going forward. Eighty percent of the DNA or the footprint, the environmental footprint is there, polluter pays – extended producer responsibility they would call it – but it’s all about paying for the damage environmentally that you do. David Palmer-Jones: “It’s a good start. 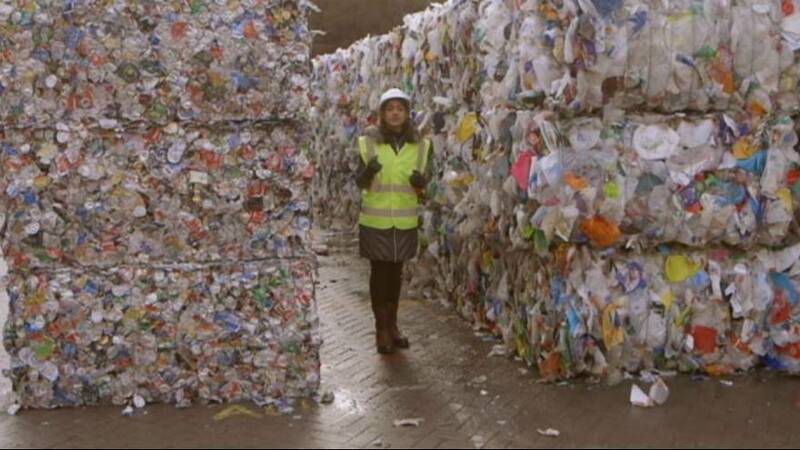 They are really trying to push that material – that 800 million tonnes going to landfill, out toward recycling, toward energy and future circularity. “What you need to do is when you push out those materials – those really valuable materials – let’s find a market for them. We need to make sure there is an active market, a viable market. With predictions that 580,000 jobs could be created in Europe, and energy cost savings of up to 500 euros per household per year, it is no wonder that cities like Amsterdam are keen to get a slice of the action. The circular economy is central to the sustainability goal of The Netherlands – potentially generating seven billion euros a year, and creating 54 thousand jobs. Amsterdam is the country’s shop window for why it works, according to the city’s deputy mayor. “As cities are growing, the push that they can organise to stimulate innovation and can stimulate transition from linear to circular can be very high,” said Abdeluheb Choho. So, how is Amsterdam going circular? Euronews’ Monica Pinna took a tour to find out. “By making the Amsterdam construction sector circular, the municipality expects to create a value of 85 million euros per year and three percent growth in productivity by 2040,” she reported. Parc 2020 – billed as a sustainable working environment – is an example of construction circularity, with growth largely coming from material re-use and efficiency improvements. Nothing can be wasted at the site, since each building is made up of things that can be re-adapted for future use elsewhere. “The challenge is to build in such a matter that you can easily reuse components,” said Guido Braam, a circular economy initiator in The Netherlands. “The current linear system is totally sub-optimised by every player in the supply chain. Amsterdam’s waste is now a source of income and energy. Every year, each city resident, throws away around 370 kilograms of waste on average. Twenty-seven percent is separated and goes through the AEB incineration complex. “What we see here is the bottom ash with still a lot of valuable metals and other materials in that. You can filter that out to be reused,” explained Marc de Wit, Director of Strategic Alliances, Circle Economy. What happens next closes the economic circle. “Annually we have 300,000 tons of bottom ash leftover from the factory. About 10 percent of that is recycled as metals, the remaining 90 percent is minerals that we use to make tiles that are being used to make streets, pavements etc,” explained Loek van Poppel, Programme Manager, Inashco. Amsterdam aims to recycle 30 percent of municipal waste by 2016 and 65 percent in 2020. The overall EU target is 65 percent by 2030. The EU also now has a target to bring landfill use down to 10 percent of waste by 2030. But there has been nothing going into landfill in The Netherlands since 2010, as the country leads the circular economy charge! Will circular thinking take off? David Palmer-Jones: “Oh, its extremely realistic. You know all that material we’ve got to play with, it tends to – because we do more and more urban living don’t we, so it tends to come towards the population bases. “So what you need to get real circularity is a bit of scale – So they’ve got scale in the likes of Amsterdam, that’s a big population. Industrial symbiosis is a big word – it just means somebody’s waste is another man’s raw material. David Palmer-Jones: “Here and now, help us through this first period, create those conditions for the market to allow us to play and then for me it’s all about designing away waste. "Somebody’s waste is another man’s raw material"